This blog is part of a conversation with other people who want a radically changed culture. Are you working towards a practical collaborative sustainable way of living? Looking for ways to create an economy run not for financial gain but for quality, social need and a healthy environment? Exploring ways in which we could grow community based economies? I think there are practical routes through to it, using communications technologies and systems principles. 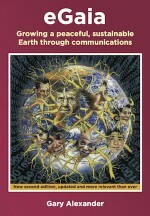 I spell out all of this in my book eGaia, Growing a peaceful, sustainable Earth through communications. 2 Responses to Welcome to EarthConnected! Best wishes for the success of your work, Gary. money in their account. In fact, all the money that you deposit into a bank account becomes the legal property of the bank, which means your bank is then free to use it as it sees fit. Not only are customers unaware that any money they deposit into a bank is no longer legally theirs, a significant proportion do not even understand that the bank will use the money in their accounts to help fund loans and investments. When told that the bank does not just keep their money safe in its vaults but will put at least some of it at risk, 33% of people answered “This is wrong—I haven’t given them permission to do so.” “. Hi Gary, found your book a few years ago, and came back to it again when i was migrating content from one of my community tech platforms GroupUp (https://groupup.me/) to the next iteration, Nectar (https://nectar.earth/). Feeling we are definitely tuned into the same thing : ) Would love to chat at some point. And here is a basic map i made of ~2500 communities around the world https://maps.nectar.earth/communities .